I’m a Greek Yogurt fan. 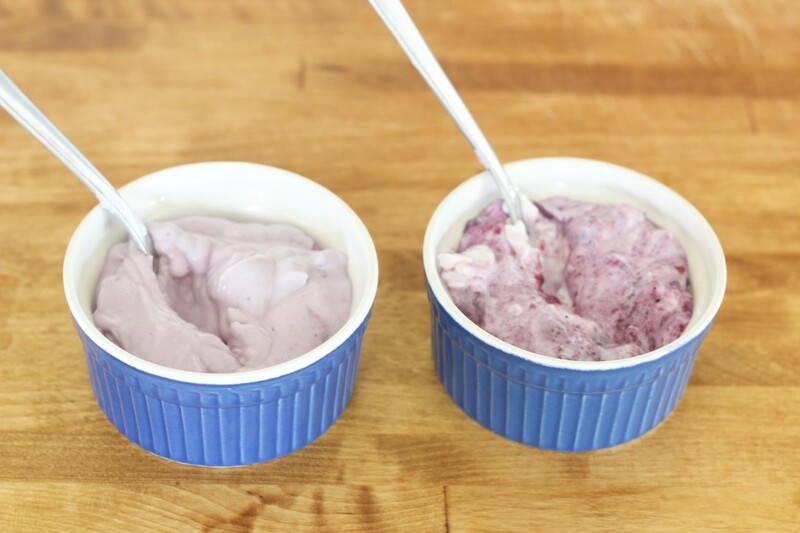 I don’t love regular yogurt but Greek yogurt is thick and creamy and full of protein, so it’s a winner. But nowadays there are lots of different brands and varieties and it can be easy to get stuck in a rut picking the same brand. There might be a better one out there and you would never even know! 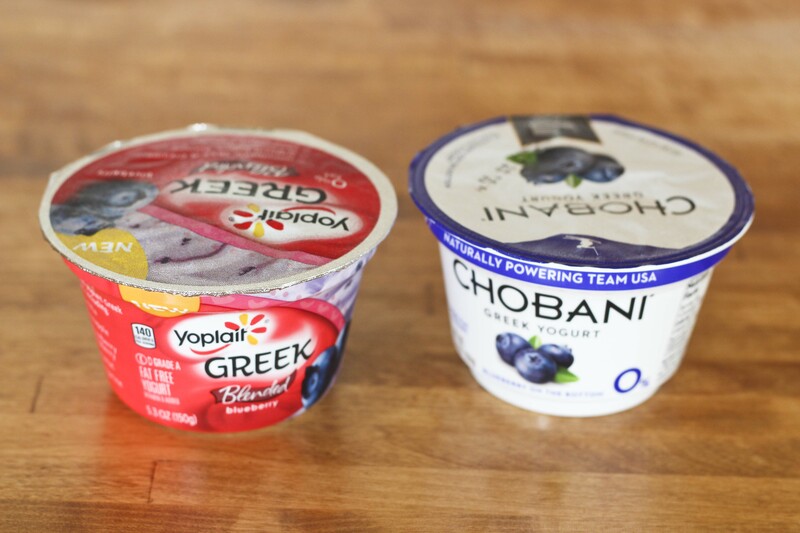 So I took the Yoplait Greek VS Chobani taste-off challenge to see which one was better. I have tasted several Chobani flavors in the past and they were good, so I was expecting it to win. I bought both brands in the same flavor–blueberry. First I stirred them up to combine the settled water with the yogurt and the Chobani is only fruit-at-the-bottom. Then I put both yogurts in a ramekin with a spoon and then moved them around so I wouldn’t remember which was which. You can tell from looking though (the Chobani is not nearly as smoothly combined as the Yoplait) so I closed my eyes to take a bite. The first bite was definitely Yoplait–you can tell right off the bat. It’s very smooth and creamy. It tasted very good. Then I tried the next one and it was actually still pretty good, and it seemed like the blueberries were a little juicier. But after eating several more bites, I decided that I preferred the Yoplait because it was so much smoother and creamier. Since I had to stir up the Chobani myself, it wasn’t combined nearly as well so the texture and flavor wasn’t consistently good. 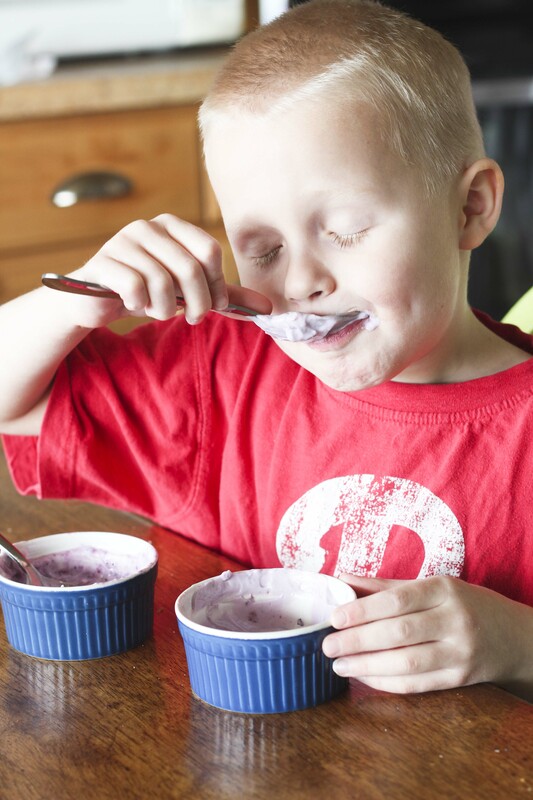 I had my 5-year-old try them both too, and right away he said he liked the Yoplait better. It just looks better…it’s evenly mixed and a pretty color. And all moms know that little kids are won over by the look of food just as much (if not more) as the taste. Not to mention, the Yoplait has no artificial sweeteners and has natural colors and real fruit pieces. It’s available in tons of flavors: blueberry, coconut, pineapple, strawberry raspberry, vanilla, tangerine, cherry, raspberry, and strawberry! So now that I’ve done the Taste-off challenge, it’s your turn! Go purchase both Yoplait Greek blueberry and Chobani blueberry Fruit on the Bottom and see which one you like better! Post your results with the hashtag #tasteoff. Today’s #TasteOff was sponsored by Yoplait, but the winner was my honest choice. Children’s tastes are often different than adults, for obvious reasons, but I’m more concerned with what’s in a product, and the ingredients it contains. Reading ingredient labels should be a factor when making choices about the products we buy, and feed our families.